How can Red Dead Redemption 2’s multiplayer live up to GTA Online? Grand Theft Auto has always been a pop culture pastiche. Whether it be GTA: San Andreas’ nods to Boyz n the Hood or Vice City’s homages to Scarface, Rockstar’s open-world crime epics borrow from genre classics and broader contemporary culture. References to movies litter GTA V’s vast map, too, peppering every conversation, and even disguising themselves as street names or witty one-liners from passersby. Related: the best sandbox games. Cruise over to the Discount Clothing Store in Grapeseed and you will find a diamond print, white-and-black jacket with a yellow crab on the back, just like the scorpion jacket worn by Ryan Gosling in Drive. In the main story, when Michael discovers his wife is cheating with the tennis coach, he goes all Lethal Weapon 2 by tying a truck’s winch to the struts on what he believes to be the coach’s house, pulling the balcony down. Head to the cliffs near Sandy Shores airfield at around 7pm and you will see two women barrel off a cliff in a convertible, Thelma and Louise style. Dive deep into the waters off the east coast of the map and you might come across the mysterious hatch from the TV show Lost. Trevor’s Los Santos apartment, a second-story condo located near Vespucci Beach, is similar to one depicted in Quentin Tarantino’s Jackie Brown, while Michael’s estate looks exactly like Anthony Soprano’s house. The game’s heists are straight out of Heat and The Italian Job, too. GTA is Disneyland for crime movies. Rockstar have also harnessed the power of pop culture references to give more colour to GTA Online, and is part of why their multiplayer sandbox is so enduringly popular. You can play out the famous chase scene from Terminator 2, gunning a motorbike through the canals of Los Santos as a big rig tries to crush you under its massive wheels. In Hunting Pack and Keep the Pace, you are tasked with keeping a vehicle above a certain speed lest in explodes – just like classic Keanu Reeves flick Speed. Meanwhile, Deadline puts you on neon superbikes and asks you to block off rivals with a light trail shooting out of the back – a nod to Tron, in case you somehow missed that one. More than pop culture references, their implementation in GTA Online displays the true versatility of Rockstar’s multiplayer platform. 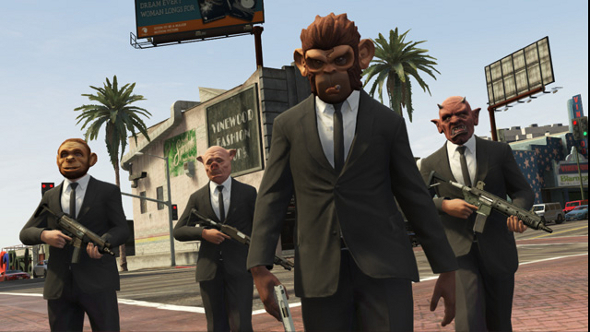 Its huge, ever-expanding online modes enable GTA Online to essentially be any game its developers want – it is LittleBigPlanet with an AK47 and a filthy mouth. Proof of that can be seen in how Rockstar have actually gone on to recreate entire rival games inside their bulging online sandbox. If you fancy a deathmatch, GTA Online can cater to that, offering multiple modes to satiate your virtual bloodlust. Want to defend a building while another team attacks like in Rainbow Six Siege? You can. Fancy a straight-up deathmatch in first-person, like Call of Duty? Get your assault rifle ready. If you do not want competition, there are co-op heists and Gears of War-esque horde modes to tackle. 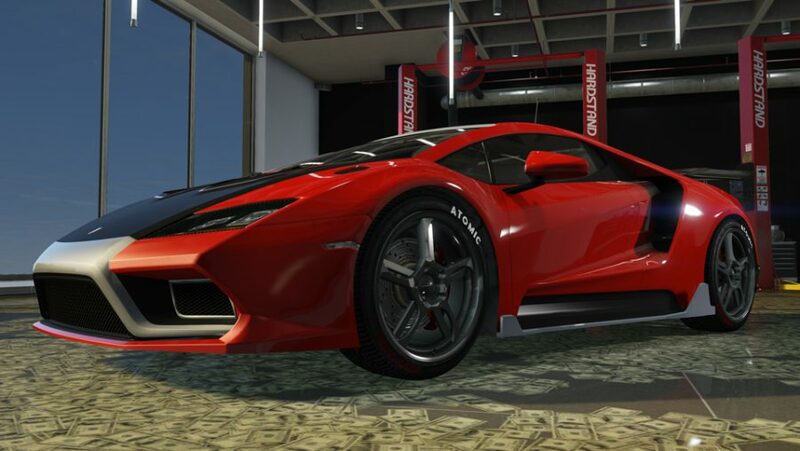 Then, if you get bored of guns you can take part in a myriad of extreme sporting activities, or you can pretend you are playing Need for Speed by getting behind the wheel of a tricked-out supercar and tearing across hundreds of player-created or Rockstar-approved race courses. You can even climb into a clapped-out banger and shunt your opponents out of the ring in the Destruction Derby-esque Sumo mode. A mode called Slashers was added to the game in a Halloween update. Taking inspiration from the new wave of asymmetric multiplayer horror titles like Friday the 13th and Dead by Daylight, a team of flashlight-wielding players must escape the machete and shotgun-equipped slasher who hunts them through a darkened environment. It does not stop there: Tiny Racers is Micro Machines. 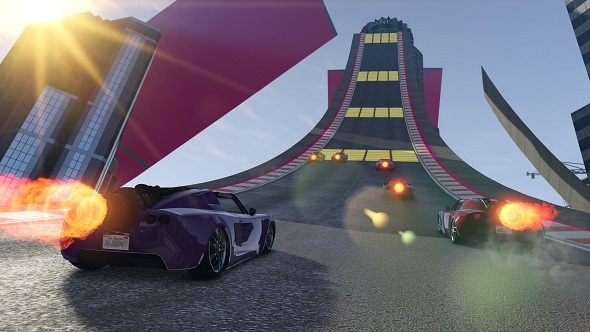 The Cunning Stunts update turned GTA Online into Trackmania. More recently, the Smuggler’s Run update for GTA Online added a mode called Motor Wars. Teams of players parachute onto an ever-shrinking map and are forced to scavenge for weapons as the playable zone gets increasingly smaller. The winners are the last team standing. Essentially, it is Rockstar’s take on PlayerUnknown’s Battlegrounds, albeit with a much lower player count and a focus on vehicular combat – PUBG via Mad Max. It would not be surprising to see an online zombies mode turn up at some point in the future. With GTA V, Rockstar have created the perfect multiplayer game. Its various modes might not be as polished as their inspirations, but why would you buy ten different games when GTA Online can give you a similar experience in a single package, all within one of the finest, most wonderfully-realised virtual worlds ever created? The strategy has paid off since GTA V is perpetually in the Steam charts. This is without even taking into account how it has held its value, or even how Rockstar earn additional money via in-game purchases. Is it possible for Rockstar to ape this success with Red Dead Redemption 2? Will that game’s sparse sandbox, set in an era when people’s feet were planted firmly on the ground, prove to be as versatile as GTA V’s? It seems unlikely. Perhaps, then, Rockstar will try a new tactic altogether. Maybe Red Dead Redemption 2’s online portion will take inspiration from another popular genre: survival games. Adding survival mechanics such as hunger and thirst, forcing us to battle the elements as well as rival crews, could add weight to its online portion. It seems like the logical next step in a world without multi-car garages, private jets, and expensive condos to splash out on. Or – whisper it – maybe there’s even room for the battle royale genre to throw its weight about, shipping players onto the map via steam train before sending them off to find a horse, equip a gun, and hole up in some tavern. Culminating in a high noon showdown, of course. But whatever form the sequel’s online portion takes, it would be bolstered by the addition of something that’s missing from the first Red Dead Redemption’s multiplayer: permanence. If you get in a shootout with another player, it can last a while. You get shot from your saddle by some sniper, you respawn, you get revenge, they do the same. It gets old quick. 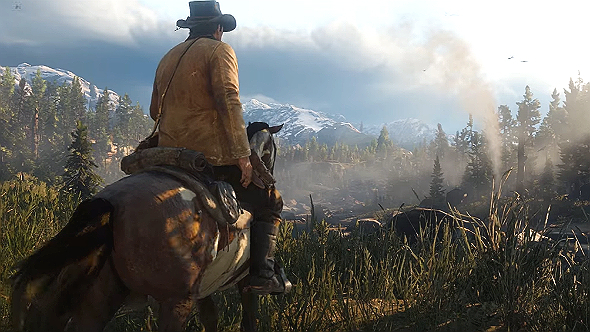 Rockstar could instead lean into the setting – this harsh, untamed environment – and make things stick: stripping you of your belongings and banishing you back to your basecamp upon death. A happy side effect of this change could be that rival players are more careful about initiating combat, which could also breed more cooperation and even the occasional last-minute double-cross, truly capturing the spirit of that setting. The survival genre is one that Rockstar have thus far left alone in GTA Online, despite its popularity. Perhaps they are saving it for a landscape where survival is thematically important? 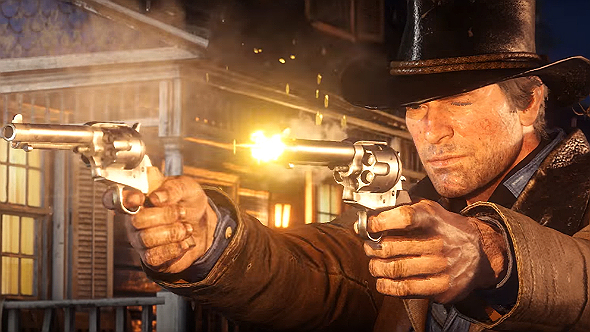 Whatever happens, it is clear that Rockstar will be looking at the industry as a whole, seeing what is popular, and borrowing the right components (from the good, the bad, and the ugly, no doubt) to create another monster – a monster formed from bags of cash with big dollar signs plastered on their sides.